The goal of the Healing Art Cart program is to bring the proven healing benefits of nature photography into patient rooms, while simultaneously giving patients the sense of control that is often missing from the experience of being hospitalized. Any object that is taken out of one patient room and brought into another must be fully sanitized between rooms. The infused aluminum prints used in the Healing Art Cart program support good infection-control protocol because they can be fully disinfected without damaging the image. Some have asked about using TV screens instead of prints. Research from Harvard and elsewhere suggests that looking at screens can interfere with circadian rhythms, and may even increase cancer risk! Having fostered a relationship with Legacy Health, I reached out and was granted permission to pilot the Healing Art Cart program in the Legacy Oregon Burn Center at Legacy Emanuel Medical Center. A shoestring budget meant that everything had to be done in the simplest way possible. The biggest challenge was creating affordable vertical storage for all of the prints that could also be transported through the unit. Although the final design will be made of non-porous metal and plastic, wood proved the best choice for a rapid and inexpensive prototype for portable art storage. I worked with a cabinet maker to design and build vertical storage crates, which we finished using a very durable and chemical-resistant surface coating in order to make them suitable for use in the hospital setting. We then affixed these to a stocking cart, which gave us a prototype that was serviceable for the pilot program. Although the result very much had the look of a prototype, it would at least allow us to begin running the program, learning the ins and outs, and collecting feedback from patients and families. Survey results were extremely promising! Fully 100% of respondents indicated that the Healing Art Cart program improved their overall experience in the hospital, and detailed results showed that the program was having particularly positive impacts on measures of mental wellbeing such as boredom, anxiety, and optimism. The pilot program revealed the strengths of the Healing Art Cart program, as well as areas that could be improved upon. While I set about updating protocols and investigating design/manufacture options for the cart, I also spoke with several hospitals and other facilities who were interested in the program to learn about their specific needs. Aside from the updates I am making to the system of sample prints used to show patients image options, the main development focus is on the cart itself. A sturdier, quieter and more streamlined product will allow the program to run smoothly in a wide variety of medical units. Due to the feedback that some facilities desire larger prints, while others only have room for smaller prints, it may also be necessary to develop multiple iterations of the cart to accommodate various print sizes. I set about gathering ideas and resources to bring the cart from prototype to final product. A limited development budget has dictated that wherever possible off-the-shelf solutions have had to be preferred over custom-built options. Gathering inspiration from several designers, as well as hours spent slow-walking the aisles of various hardware stores, what's shown below is just a sampling. One design & fabrication shop that I worked with helped me with some preliminary drawings showing a few ways they could custom build the interior structure of the cart to accommodate vertical storage of the prints. It soon became clear that custom building anything with so many specific contours would be prohibitively expensive. It is likely that the final design will involve some degree of custom fabrication, but this conversation set me on the course to find as many off-the-shelf components as possible. By piggybacking on the economies of scale achieved by existing mass-produced components, costs can be contained to some degree. Up to this point I had been designing around the inset frame that I used for the prints in the pilot program. After speaking with the production manager at the photo lab about other options, I began to think that bringing the frame all the way to the edge might solve a few problems. For starters, it might simplify the vertical storage design on the cart. Additionally, it would make the process of locking and unlocking the security screw a bit easier when swapping prints. If I brought the frame to the edge, then an extruded plastic or rubber channel could effectively hold the prints in place. 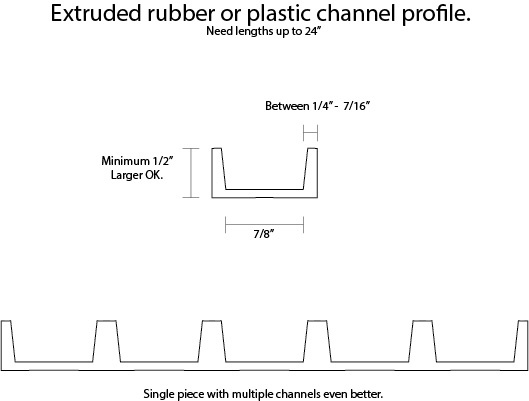 The setup cost for a custom extruded profile can be very high. 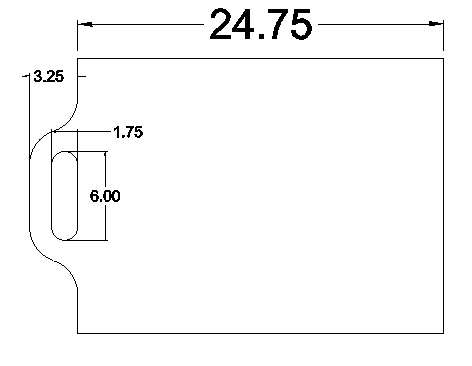 Fortunately, there is some flexibility in the shape and dimensions that would be required to do the job well, so it is possible that an extrusion company will have already done the tooling on a product for another client that could be used to make a workable product for this project. Further research into this is required. The combination of some targeted Google searching and many hours spent in local hardware stores yielded a handful of promising ideas. For example, when working on the question of how to secure the prints inside the cart to prevent them from rattling when the cart rolls over a bump, I was able to combine several items to create a few versions of an idea for clamping a padded bar against the prints, either pushing them down into the channels or back against another pad that sits behind them. Although these solutions represent substantial improvement over the original pilot cart design, they are also likely to be just one iteration in the design process, leading eventually to even more streamlined solutions. The idea came to me recently to combine two features that the cart will need - a way to hold the prints securely when the cart is moving as described above, and a place to put the prints so they can be sanitized before returning them to the cart - into a single fixture. By prototyping a specialized rocking hinge, I came up with a way to push a padded surface against the prints in the cart, and then rock that fixture upward to create either a flat or slightly angled place to put the prints for cleaning. I'll need to compare a few options for how to lock the fixture into each of the desired positions, but I think this could be a great way to meet both needs while also reducing the amount of material that I expected to use for a work surface on the top of the cart. Funding is needed to take the feedback and design insights outlined above and develop them into a production-ready unit. In addition to this development work, my conversations with various hospitals about the program has revealed that while some hospitals may be able to self-fund the program, many simply are not structured to do so. Therefore, in order to bring this program into hospitals nation-wide and around the world, some form of outside funding will need to be secured. Some have suggested using a crowdfunding platform like Kickstarter or GoFundMe to raise the money needed to complete the development work, and I'm looking into this option. Crowdfunding is not a viable option, however, for the program costs involved in establishing the Healing Art Cart in each hospital unit. Without some specific draw to providing the program in a specific place, crowdfunding seems likely to be a one-time opportunity, as people will not be likely to contribute over and over for each successive implementation of the program. Two remaining options are to secure corporate funding through a corporation that has an interest in promoting patient wellbeing, or to form a partnership with a non-profit whose mission aligns with the goals of the program, who would pursue grant funding and act as the fiduciary when funding is secured. I welcome individuals or organizations who may be able to help with funding the Healing Art Cart on a larger scale to contact me or make a donation using the buttons below.